Give your home a modern look with a hint of retro styling with this fabulous wall clock. Frameless design for that minimalist look. Perfect for displaying in the living room or hallway. Sophisticated look that will suit modern and contemporary styled interiors. 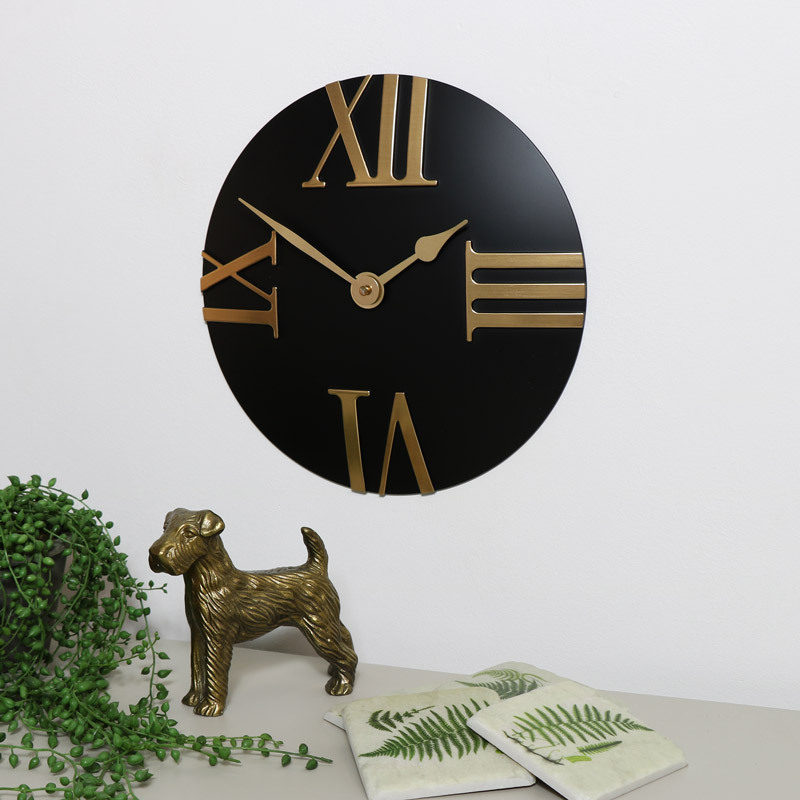 The clock features large gold Roman numerals and hands against a round black background. The contrasting colours make this eye catching. This is the ideal clock for making a bold statement in any interior. Give your home a modern look with a hint of retro styling with this fabulous wall clock. Frameless design for that minimalist look. Perfect for displaying in the living room or hallway. Sophisticated look that will suit modern and contemporary styled interiors. The clock features large gold Roman numerals and hands against a round black background. The contrasting colours make this eye catching. This is the ideal clock for making a bold statement in any interior. 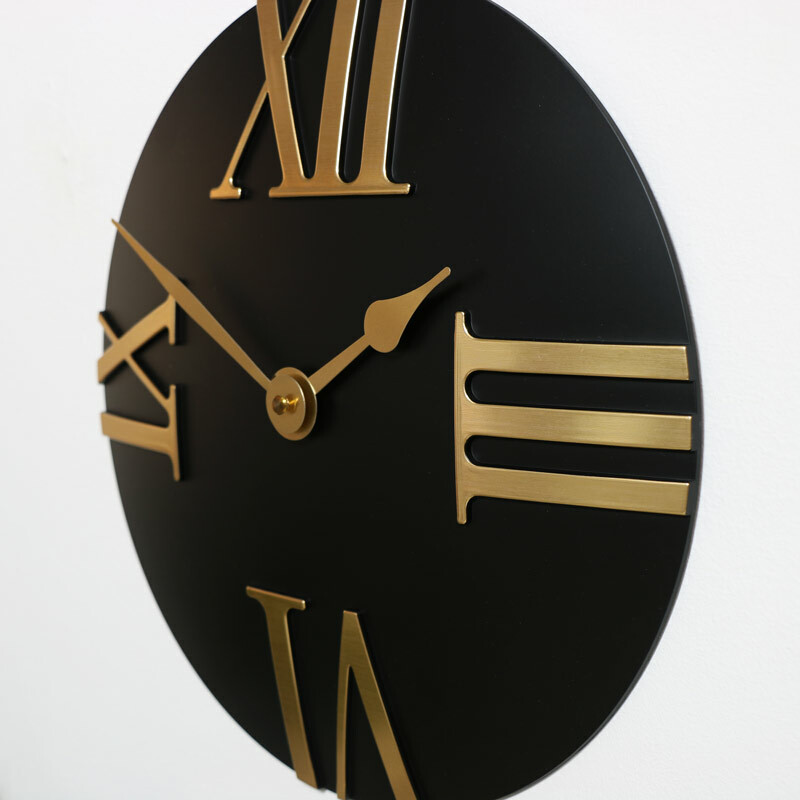 The clock in made from a sturdy plastic design in a matt black finish with gold numerals and hands. Easily wall mounted with a hook on the back, takes x1 AA battery (not included). Clocks can be the finishing touch on any room and interior, if this is not the perfect one for you then be sure to look at our ever growing collection of clocks as we are sure to have what you need.